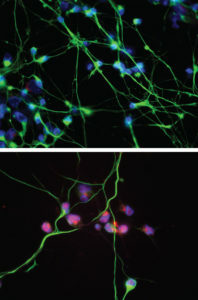 These images illustrate the difference in susceptibility to HSV-1 infection — indicated by orange staining — between central nervous system neurons (top) and peripheral nervous system neurons (bottom) in iPSC-derived neurons from a control patient without TLR3 mutations (green staining for neuronal marker and blue for DNA). A team of scientists developed a novel stem cell model to demonstrate that a pathway protecting neurons in the brain from herpes simplex virus 1 (HSV-1) infection does not exist in neurons throughout the rest of the body. The study, published in Proceedings of the National Academy of Sciences, helps explain why the virus is common in the peripheral nervous system but rarely infects the brain, and it provides new insights into mechanisms of HSV-1 encephalitis — a rare and deadly viral-induced inflammation of the brain. Gregory Smith, PhD, professor of Microbiology-Immunology, was a principal investigator of the study, a collaboration between Northwestern University, the Sloan-Kettering Institute for Cancer Research and The Rockefeller University. 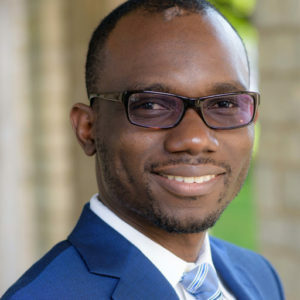 Osefame Ewaleifoh, a PhD/MPH student in Feinberg’s Driskill Graduate Program in Life Sciences (DGP), was a co-first author. HSV-1 is a widespread virus that infects close to 80 percent of people around the globe. In most cases, the virus remains latent in the peripheral nervous system, from where it remerges to cause cold sores. In rare cases, however, HSV-1 can reach the central nervous system and cause life-threatening brain swelling called encephalitis. HSV-1 encephalitis is the most common sporadic encephalitis of children and carries a high rate of mortality and complications. The research consortium previously demonstrated that cortical (brain) neurons from patients with mutations in a protein called TLR3 are highly susceptible to HSV-1 encephalitis — suggesting the protective role of the TLR3 pathway. However, it remained unclear whether TLR3 mutations are also associated with increased susceptibility to HSV-1 in sensory neurons outside the brain, which thus might also contribute to the development of HSV-1 encephalitis. In the current study, the team of scientists developed a novel method for creating sensory neurons from human induced pluripotent stem cells (iPSC), which would allow them to observe HSV-1 infection in cell cultures, for both healthy controls and patients with TLR3 mutations. Osefame Ewaleifoh, a PhD/MPH student in Feinberg’s Driskill Graduate Program in Life Sciences, was a first author of the study. Using the new stem cell model, the scientists discovered that when the virus was added to the culture of human stem cell-derived sensory neurons, both the TLR3-mutated and control patients were equally susceptible to infection. Consistent with previous research, brain neurons from patients with the TLR3 mutation were highly susceptible to infection, while brain neurons from control patients were resistant to infection. The findings provide further support to the role of TLR3 pathway deficiencies in the development of HSV-1 encephalitis and deepen understanding of the disease, which could lead to new therapies and better diagnostics in the future. The novel stem cell model can now also be used to study other viral infections. “We’ve established that we can model the sensory neuron phenotype in herpes infection that explains why most people have viral lesions on their skin, but we can also model the resistance in the brain that explains why viral encephalitis is rare — and that’s very exciting,” Ewaleifoh said. The study was funded by National Institutes of Health (NIH) grant R01NS072381. Additional support was provided by NIH Grant R21NS084255, NIH Cancer Center support Grant P30CA008748, the American Society of Microbiology Robert Watkins Graduate Fellowship, Clinical and Translational Science Award program Grant UL1TR001866, Agence Nationale de Recherches Grant IEIHSEER, the Rockefeller University and INSERM.